We start by spreading glue over the ouside of the styrofoam cup. Put just a thin layer on, so it dries quickly. Before it dries, cover the cup with aluminum foil. Press the foil flat against the cup, so any wrinkles are pressed down. 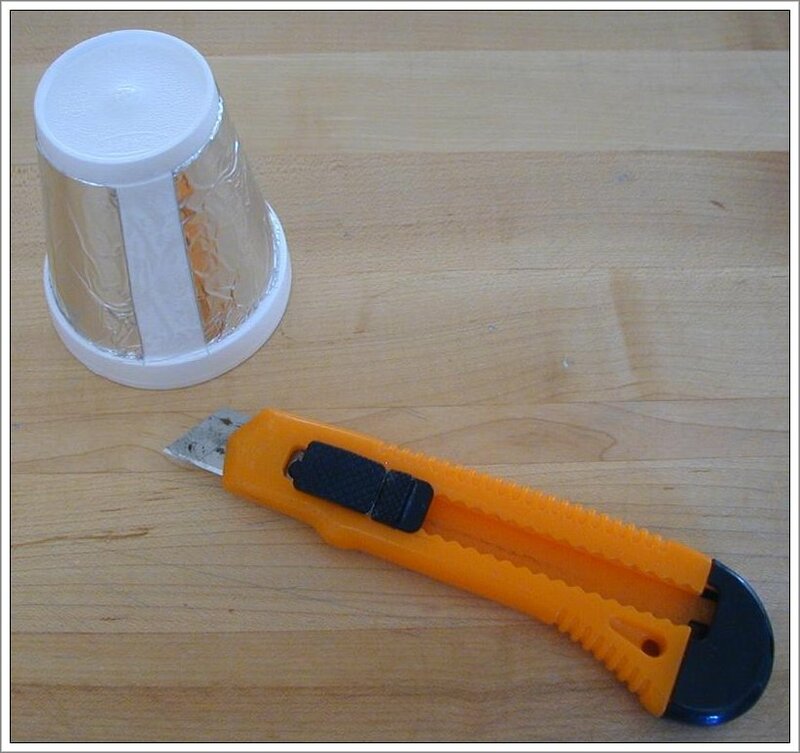 With a sharp knife, neatly cut a half inch strip out of the foil on both sides, so you have two patches of foil, one on each side of the cup, that do not touch one another. The cup is going to be spinning upside down on the point of a ball-point pen. 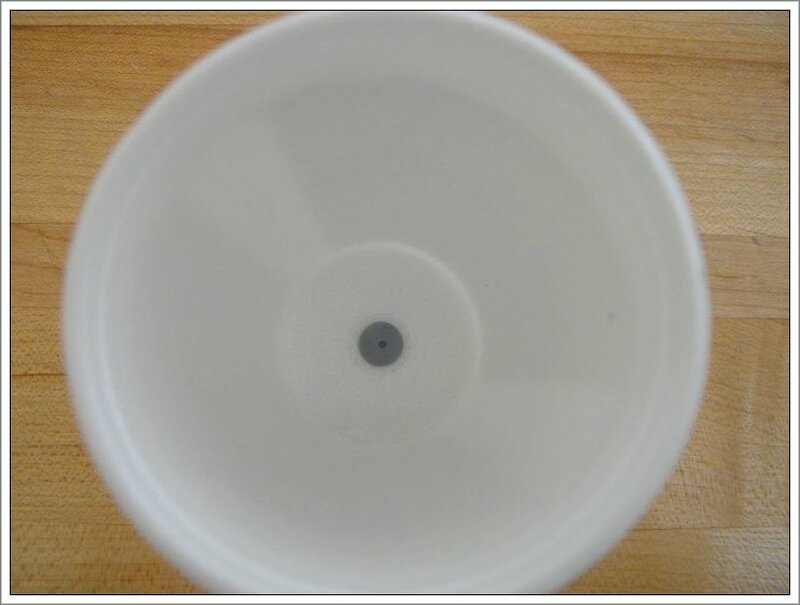 To keep the cup centered on the pen-point, and to provide a low friction bearing, we need to glue something hard to the center of the bottom of the cup, something that has a little dimple in it to sit on the pen-point. I chose to sacrifice the end of another ball-point pen. 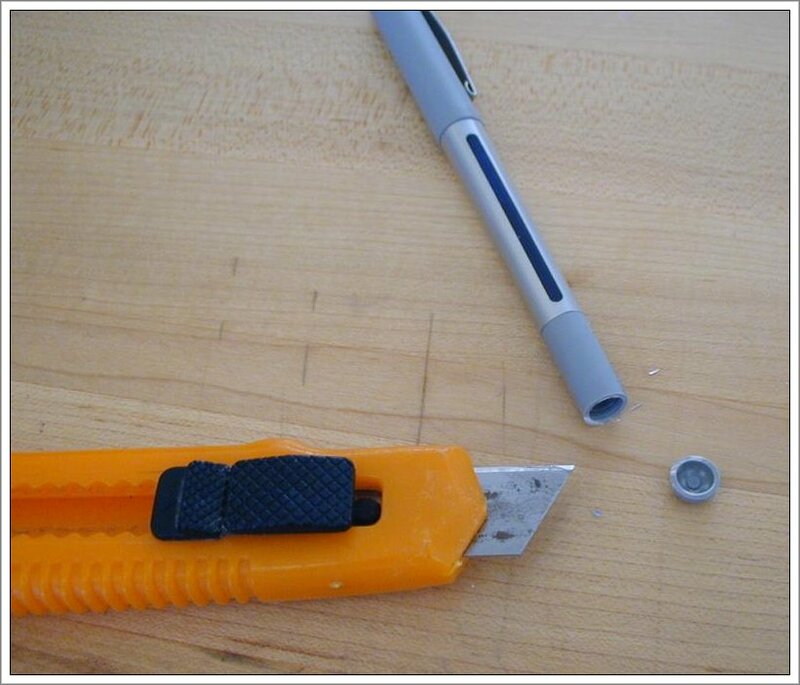 The photo shows the end of the pen, cut off with a sharp knife. The side of the cut end that is facing down has a little dimple that is perfect as a place to accept the point of the other ball-point pen. The end of the pen is glued in the exact center of the bottom of the cup, as shown below. Note the little dimple. Next we make the stand for the motor. Start with a paper plate, and glue the bottom of a ball point pen to the exact center of the plate, so the point stands straight up. 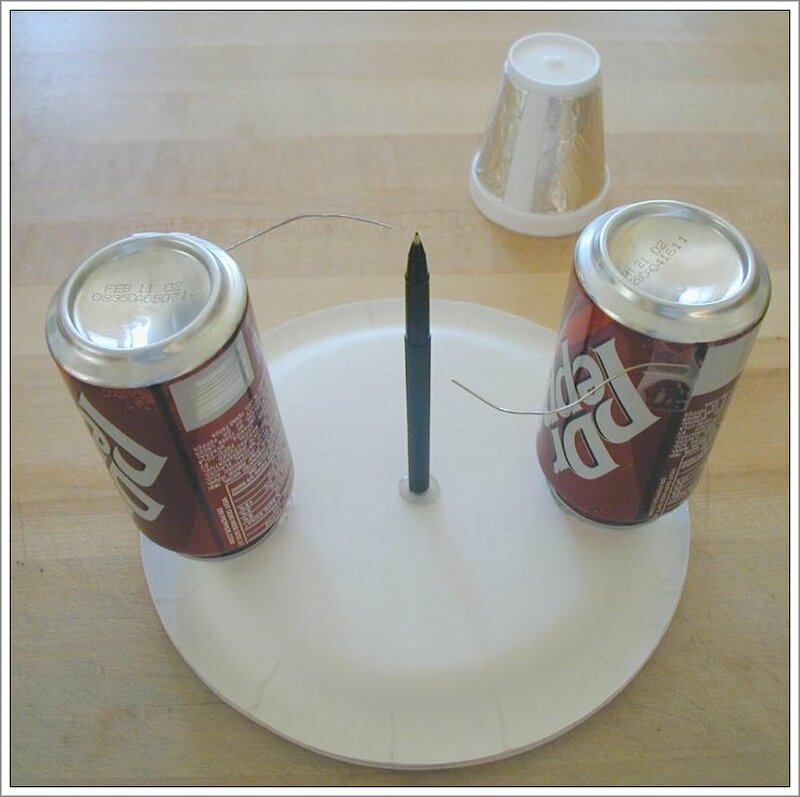 Glue the two soda cans upside-down onto the plate, leaving enough room between them for the strofoam cup to rotate easily without touching either can. There should ba about a half of an inch gap between the cup and either can. Straighten two of the bends of a paper clip (leaving one end bent as in the photo below) and tape them to the cans as shown. Bend the wires into an S shape, leaving enough room to place the cup on top of the pen. Now connect a wire from the can on the right to a large sheet of aluminum foil pressed against the screen of a TV (or a computer with a CRT screen). Connect another wire to the left can, and connect the free end to a good ground connection, such as a cold water pipe, or the metal frame of a computer. In a pinch, you can just hold onto the free end, since your body is a good enough ground for this little motor. 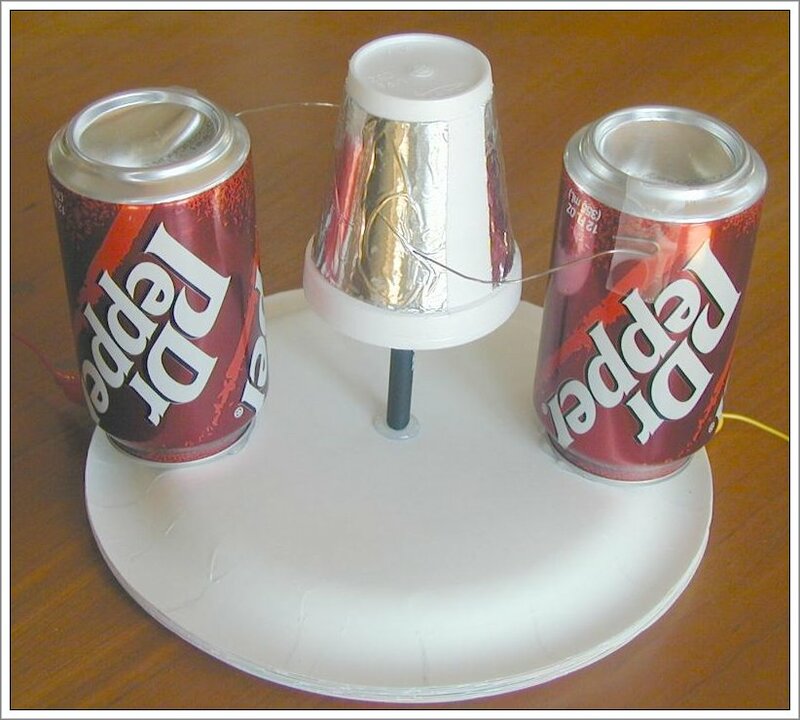 When you turn on the television, the foil will pick up a high voltage, and the little motor will start spinning. As it slows down, turn the television off, and the motor will get another kick, and spin faster. You can keep this up as long as you feel like turning the TV on and off. The can on the right is charged with high voltage from the face of the TV. This means that the electrons are pushed onto the can with a lot of electrical "pressure". The electrons all have the same negative charge, and so they repel one another. At the point of the wire the electrone are most crowded, and so there is the highest pressure. It is so high that the electrons can get pushed right off the wire, landing on the air molecules near the wire. These air molecules are now also negative, so they are repelled by the extra electrons in the wire. They move away from the wire, and hit the aluminum foil, where the electrons leave the air molecules and collect on the foil. The electrons on the foil are repelled by the can on the right, which still has an excess of electrons. The electrons in the can on the left are repelled by the electrons in the foil, so they move away from it, leaving behind the positively charged nucleus, which attracts the electrons in the foil. With the right can repelling, and the left can attracting, the foil is pulled to the left, and the cup rotates. Half a revolution later, the charged foil is next to the wire that is attached to the ground. The electrons from the foil charge the air around the wire, and the electrons can move from the foil through the air and the wire, to the ground. This leaves the foil uncharged, so it is not repelled by the can on the right as it moves by. At this point we are back to where we started, and the process starts over again.